Turn your garden hose in to a multi-purpose water and high pressure cleaner. 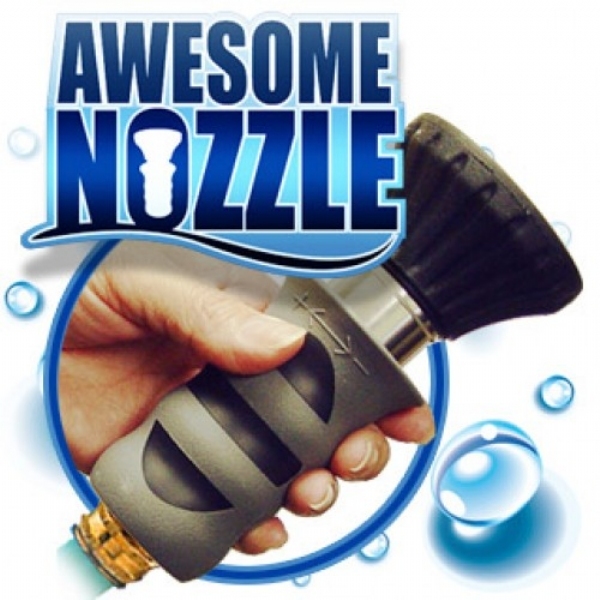 The Awesome Nozzles turns your garden hose in to a multi-purpose water and high pressure cleaner. Low water pressure isn&apos;t a problem with the Awesome Nozzle, since it can increase water pressure up to 220 PSI. Features an adjustable spray pattern from a near solid stream to a broad fan and a comfort grip. Now you can gently water your flowers and vegetables in the garden or pressure wash your car or RV. The one hand operation allows you to turn the pressure of your garden hose from 40 PSI to 240 PSI. Turns your garden hose into a pressure washer, wash second story windows and siding the top of your RV safely without dragging out a ladder. It is the last hose nozzle you will ever buy. From the creator of the Awesome Auger. The add seems to make you believe that this nozzle can replace a washer pressure, maybe if you have good water pressure to start with but not being our case, it is just a solid made hose nozzle as good as many other from hardware stores. I am able to reach the 2 nd story windows but not enough pressure to clean the windows, so I had to get my washer pressure to do the job. Publicity is exaggerated. It is not a power washer but it is the closest to it I have found. Just bought my second one. Solid construction, it will last forever.